Funerary composition, whose name means 'that which is in the underworld'. The Amduat dates back to the New Kingdom (first appearing in the tomb of Tuthmosis I), in a number of tombs in the Valley of the Kings. In addition to the royal tombs, for which it was actually intended, the tomb of the vizier User from the time of Tuthmosis III also includes parts. The Amduat sketches the nocturnal journey of the sun god through the earth, beginning in the west and ending with his rebirth in the east. Almost everywhere, the scenes are divided in three registers. The middle register depicts the river that flows through the centre of the earth, comparable with the Nile in Egypt. The solar bark and its crew sail on this river. The two other registers are the banks, on which the inhabitants of the underworld live. In addition to hundreds of figures with captions, the composition also contains longer texts explaining what is happening. It is divided into twelve hours, separated by texts that introduce these hours (a different book of the underworld, the Book of Gates, divides the hours from each other by depictions of gates). There is only a slight relationship between the events and the hours in which they are depicted. The central moment in the sixth hour, the deepest point of the underworld, is the unification of the sun god with the body of Osiris, comparable with the unification between the 'ba' and the body. In the Amduat the sun god is often depicted with the head of a ram, the symbol of the 'ba'. Other hours depict the ominous noises in the underworld (the sound of buzzing bees, of screeching cats, etc.) or the necropolis of Rosetau and the land of 'Sokar who is on his sand', two sandy areas through which the solar bark has to be pulled. 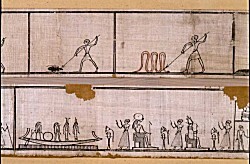 The last few hours are a preparation for sunrise, including victory over Apophis (who appears earlier, in the seventh hour, trying to ground the solar bark on his sandbank), and eventually rebirth in the form of a scarab (the god Khepry). The aim of the whole composition is to gain knowledge. According to the text, whoever knows these secret representations is a well-equipped akh, who can enter and leave the underworld. Alongside the long version of the Amduat there is also a shorter version without illustrations and captions. In the Late Period the Amduat was also inscribed on sarcophagi and papyri for private individuals, with a preference being shown for the last three or four hours, which have the rebirth as the central theme.